Posted in Government, Immigration, News, Research, under North America. Tagged with Council of Graduate Schools, Trump, US. First-time international graduate enrolments at US institutions have decreased for the second time since 2003, dropping by 3.7% between 2016 and 2017, a new report by the Council of Graduate Schools has revealed. The report ‘Graduate Enrolment and Degrees: 2007 to 2017′, which analysed data provided by 619 institutions revealed the 0.9% decrease in the 2015-16 academic year has now grown into to a 3.7% decline. 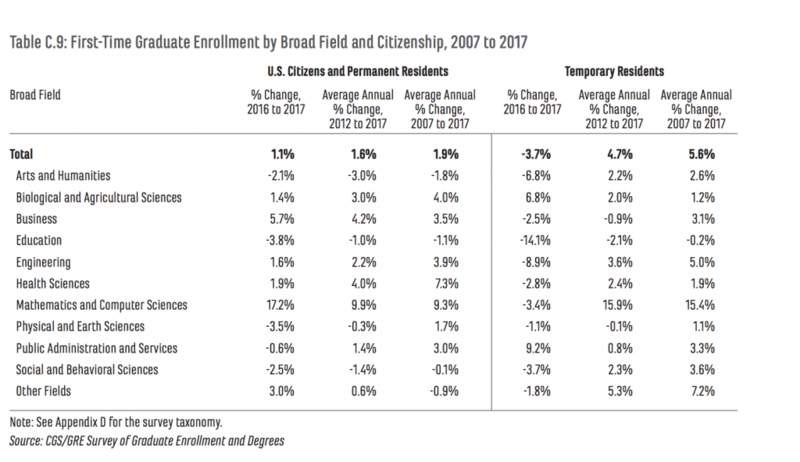 By contrast, first-time graduate enrolment for US citizens and permanent residents increased by 1.1%. Overall international graduate students constituted 18.5% of total enrolment in fall 2017, compared with US citizens and permanent residents, who constituted 81.5%. In response to the report, CGS president Suzanne Ortega described the decline in the number of international students pursuing graduate education in the US as “worrisome”. “The 3.7% drop in first-time enrolment between fall 2016 and fall 2017 is the second consecutive decrease we’ve seen since 2003. While it is difficult to pinpoint what caused the decline, the current policy climate around US visas and immigration may be a contributing factor,” she said. Key stakeholders in US international education have warned that the Trump administration’s stance on immigration, coupled with delays in visa processing would tarnish the country’s reputation and continue the downturn in US international student enrolment. However, Hironao Okahana, associate vice president for research and policy analysis at CGS told The PIE News that it is difficult to pinpoint exactly what might be affecting enrolment growth because of the number of countries involved. “We certainly pay attention to the policy climate around US visas and immigration, that may be one factor that’s contributing,” explained Okahana. However, the longer-term picture tells a more positive story, Okahana continued. The report showed the five-year average annual rate of change (4.7%) in international student numbers, as well as the 10-year average annual rate of change (5.6%), remains strong. Furthermore, proportionally fewer international students comprised first-time graduate enrolment in 2017 than previous years, accounting for 20.3% compared to 21.1% in 2016, and 22% in 2015. The report also showed that elective high research universities were the least affected by the volatility of international students. Institutions with the highest research productivity, by Carnegie Classification of Institutions of Higher Education, actually saw an increase in enrolments by 3% in the year 2016-17. At doctoral highest research institutions, three out of 10 (29.9%) first-time enrolees were international graduate students. In terms of field of study, international students comprised the largest share of first-time graduate students in mathematics and computer sciences (56.3%), followed closely by engineering (52.9%). Overall engineering posted the biggest application decline in the one-year period (-7.3%), indicating that the decline in engineering enrollment is largely driven by a decrease in international students, the report read. The share of international students was smallest in education (3.9%), public administration and services (4%), and health sciences (5.1%). Following on from the Supreme Court’s recent decision to uphold the travel ban, US institutions were concerned that international student numbers would continue to drop off in the 2018 admissions cycle. “We haven’t analysed the figures for the fall 2018 admissions cycle yet, but these institutions will have already seen the numbers at their own campuses, and if they have seen the decline at their own campuses they will have made efforts to restrategize their recruitment,” said Okahana. “On top of that colleges, universities and education associations have been really clear about their commitment to keeping graduate education open to the talented international students.